Writing in IRB: Ethics & Human Research, Mahesh Ananth and Michael Scheessele, both of Indiana University South Bend, argue against exempting all minimal-risk research from IRB review. They do so in terms that would require the repeal of the 45 CFR 46.101 exemptions, though it is not clear they understand the implications of their own argument. Ananth and Scheessele frame their essay as a response to Scott Kim, Peter Ubel, and Raymond De Vries, "Pruning the Regulatory Tree," Nature 457 (29 January 2009), 534-535. (For my own comments on that piece, see "And the Bush Was Not Consumed.") In that piece, Kim, Ubel, and de Vries argued for exempting minimal-risk research from IRB review, on the grounds that "it is unethical to support a system that creates a significant financial, scientific, clinical and ethical burden with virtually no counterbalancing good." Ananth and Scheessele seek to discredit this argument. First, they suggest "Kim and colleagues clearly do not adhere to a strict act-utilitarian position," and that "rule utilitarianism is not (or should not be) their overarching normative foundation. The overall implication of these arguments is that utilitarian considerations are not motivating the authors’ defense in any substantive way." This is a non sequitur. To state that someone doesn't follow a principle strictly is not the same as saying the principle does not motivate them in any way. The Belmont Report, which Ananth and Scheessele like, is no more pure in its use or rejection of utilitarian arguments than is the Nature essay. Ananth and Scheessele then struggle to find examples of minimal-risk research that merits IRB review. They offer the case of Henrietta Lacks, whose tissue was taken for study without her consent. As the authors concede, "this example differs from present-day tissue collection, storage, and research, where tissue may be voluntarily donated or obtained from medical waste and where the researcher may not be able to readily identify the individual from whom tissue was obtained." So this isn't much of an argument for IRB review. The second case they raise is that of the Havasupai, who thought they were donating blood for a diabetes study, but were dismayed when that blood was used to study other subjects, including schizophrenia. For this example to support their argument, Ananth and Scheessele would need to show that IRBs presented with such cases flag ethical concerns more effectively than the researchers alone. Though the destruction of the IRB records in that case makes it impossible to know exactly what happened, I have found nothing to suggest that the Arizona State University IRB spotted the issues that later proved so controversial. Consider sociobehavioral research, which tends to pose minimal risk. Would professors engaged in this type of research obtain informed consent from students who depend on them for a grade knowing that their research is not subject to IRB review? Moreover, sociobehavioral research has very diverse goals and methodologies and is by no means limited to participants from the population of college students. Sociobehavioral research includes ethnographic studies of certain populations, domestic or international; psychological laboratory research on cognition and perception; certain types of oral history; user evaluation of Web sites and software interfaces; mental health studies that may have both a treatment and a research component; and community activism studies that may include a research component intertwined with activism. This heterogeneous list of sociobehavioral research paradigms is by no means exhaustive. In each of these research paradigms there may be power dynamics between the researchers and the participants that raise issues about adequate voluntary informed consent. With no IRB review of these studies, it is unclear what oversight mechanism would be used to deter researchers from unduly inducing or coercing individuals to participate in their studies. Ananth and Scheessele do not mention that many of these activities, as well as much research using "pathological specimens, or diagnostic specimens, are already exempt from IRB review under 45 CFR 46.101. In other words, they are objecting not to Kim's proposal, but the regulations as they have existed since 1981. If they really believe that IRB review is necessary "to deter researchers from unduly inducing or coercing individuals to participate in their studies" whenever "there may be power dynamics between the researchers and the participants that raise issues about adequate voluntary informed consent," they are effectively calling for a repeal of all of 45 CFR 46.101. One can make a case for repealing some or all of the exemptions. Leslie Wolf, for example, has argued that "the current exceptions to IRB review for much research involving biological materials are no longer justified, fail to recognize donors' continuing interest in their biological materials and the ways in which they are used, and unnecessarily remove such research from the protections afforded by IRB review." ["Biology and Genetics: Advancing Research on Stored Biological Materials: Reconciling Law, Ethics & Practice," 11 Minn. J.L. Sci. & Tech. 99 (2010)] The ANPRM has some proposals along these lines for genetic material. The difference between these documents and the Ananth and Scheessele essay is that Wolf and the ANPRM authors understand the current regulations' scope and their grounding in a mix of principle and pragmatism. Ananth and Scheessele, by contrast, overlook the Common Rule's efforts to balance protection and freedom, and therefore exaggerate the differences between a proposal for reform and the status quo. 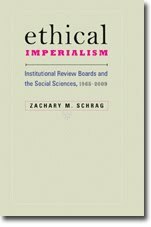 Zachary Schrag’s assertion that “philosopher and IRB chair call for repeal of IRB exemptions” is incorrect. We make no such claim, and our argument from our recent IRB article does not imply such a claim, either. Our article shows that Kim and colleagues appear to have committed a logical fallacy in assuming that what might be true of minimal-risk QI human subjects research would also be true of all minimal-risk human subjects research. As such, their argument for deregulating all minimal-risk human subjects research would be logically unsound. 2. it can be demonstrated that what might be true of minimal-risk QI human subjects research would also be true of minimal-risk non-QI human subjects research. Now, this sort of casual sentiment might hold sway in a history department, but in the domain of ethics, it does not pass muster. To adhere to a moral system at one's whim is not to adhere to the moral system. You do not get to be a utilitarian at your leisure or to a degree or only under certain circumstances. Either you are a utilitarian or you are not. Alternatively, if Schrag is suggesting that Kim et al. endorse some sort of pluralism or mixed account, it is not clear how this would reconcile with their argument. If this indeed is their position, then we anticipate clarification from Kim and colleagues on this point. I would be fascinated to know what single ethical tradition could explain the particular activities that do or do not appear in 45 CFR 46.101 and the list of activities eligible for expedited review. In the real world, sound policies are both pluralist and pragmatist. I see no reason to expect reform measures to be intellectually purer than the existing regulations, only more sensible. This shifts the debate away from our original argument, though. Of course, the Belmont report is pluralistic in its scope, informed by ethical traditions perhaps as varied as the backgrounds of the Commission members who ironed it out. This is obvious. The gist is that even when we have succeeded in making our main point (above), an utilitarian could casually dismiss our argument because the “counterbalancing good” for which we argue may be of little value to an utilitarian. That is why we had to go to the trouble of showing upfront that Kim et al. do not appear to be utilitarians making an utilitarian argument. Thank you for these comments. Kim et al. cite material relating to both QI and non-QI minimal risk research. Your one counterexample is that of the research--begun more than 20 years ago--with the Havasupai blood samples. Given the destruction of records in that case, it is unclear if anyone involved considered it to be minimal-risk research. I would suggest that the issues raised by that case would be better addressed by policies designed for genetic research, rather than continued review of all minimal risk research at the cost of tens or hundreds of millions of dollars each year, lost researcher time, and lost knowledge. If we had made a glaring oversight, such as entirely missing some significant and useful discussion of non-QI minimal risk research in Kim et al.’s article, reviewers and/or the editor likely would have caught this oversight immediately. This is the advantage of the peer-review process in journal publication over that of blogging, where unchecked mischaracterizations and half-truths are probably not uncommon.